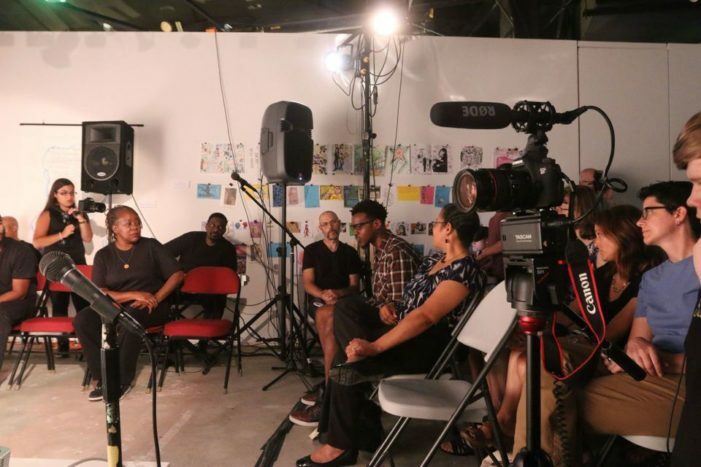 As an A Blade of Grass Fellow, artist Kevin Bott will create Ritual4Return (R4R) with formerly incarcerated individuals in New York City to develop a rite of passage supporting their return home after incarceration. Over twelve weeks, R4R participants will engage in mindfulness training and utilize tools such as drumming, storytelling, mask-making, and embodied theater practices to devise a ritual that culminates in a one-time-only public threshold crossing to mark the beginning of the next chapter of their lives. 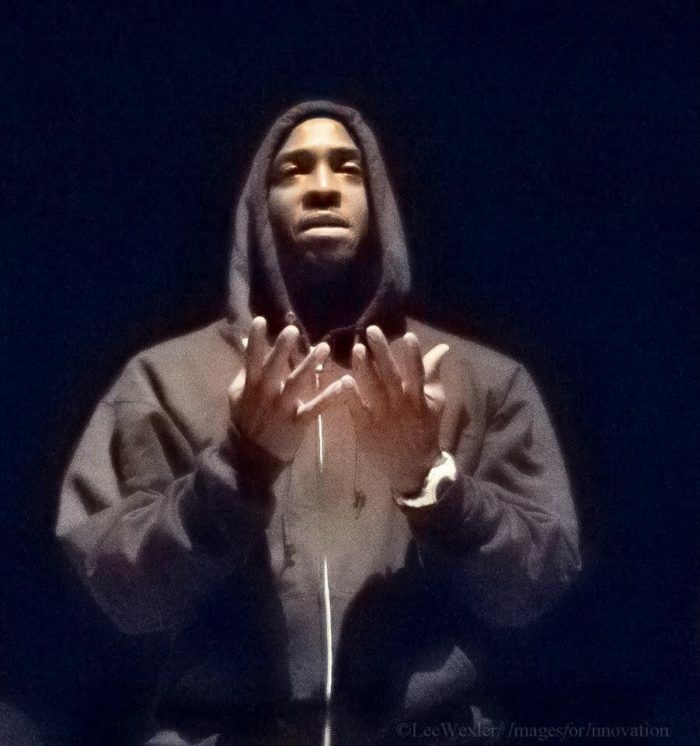 Following the culminating rite of passage, successful graduates of the program will be invited to participate in R4R’s semester-long Wounded Healer Project, where they will be trained, alongside experienced community-based artists, to facilitate the Ritual4Return for other formerly incarcerated individuals. 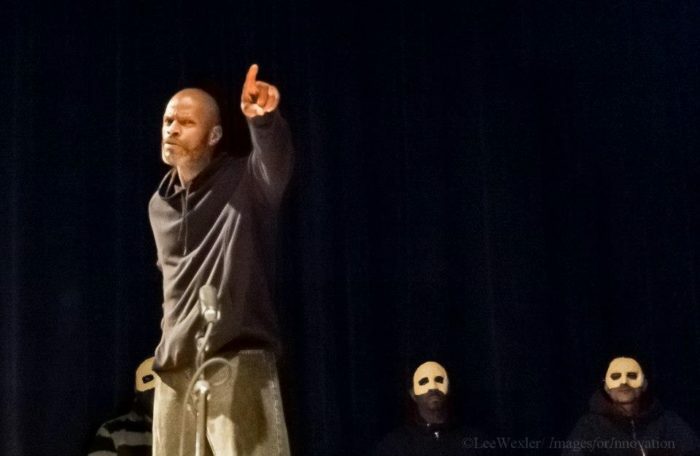 Kevin Bott is a community-based theater artist and scholar whose interests lie at the intersection of healing, freedom, justice, and movement-building, as well as in the mutually supportive relationship between individual excellence and collective creation. Bott is the founder and artistic director of Ritual4Return, which he began developing in 2008. His 2010 doctoral dissertation is entitled “A Ritual for Return: Investigating the Process of Creating an Original Rite of Passage with Formerly Incarcerated Men.” The study examines the artist’s own ethical decision making while leading five individuals through the creative process. From 2010 to 2016, Bott was the associate director & director of cultural organizing at the national higher education consortium, Imagining America: Artists and Scholars in Public Life headquartered at Syracuse University. In that role, in addition to consulting with dozens of colleges and universities on their community engagement efforts, he founded The D.R.E.A.(M. 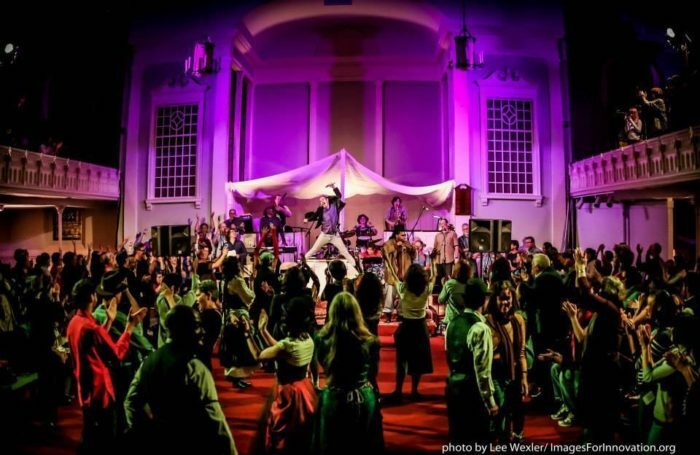 )3 Freedom Revival (2011-2015), an original musical “tent revival for freedom and democracy” that drew on the history of Syracuse and Central New York to inspire residents of the city to engage in community change efforts. While performing as the revival’s “preacher,” Bott caught the attention of New York State Green Party leaders and was approached about running for mayor of Syracuse on the 2013 Green Party ticket. Bott took up the challenge, partly as a performance art opportunity. With only $4,000 to put up against the incumbent’s $400,000 war chest, he garnered 15% of the vote. 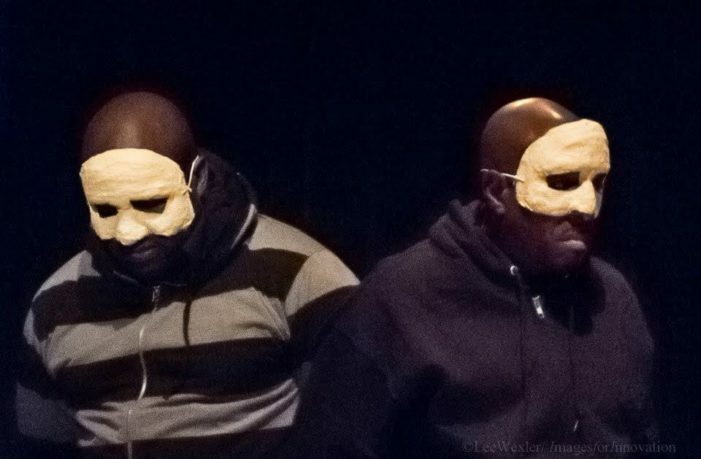 Also in 2013, Bott developed and facilitated the community-based performance, Every Time You See Me… in partnership with Wagner College in Staten Island. Built from the stories of Staten Islanders, and featuring them in performance, Every Time You See Me… explored the dynamics of race, class, power, and privilege, and was performed in the Staten Island Ferry Terminal on the one-year anniversary of Eric Garner’s murder by police chokehold. 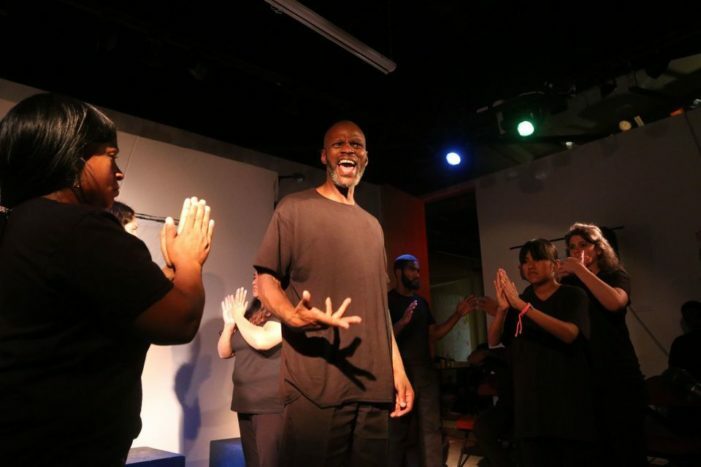 Bott was the first director of education for Rehabilitation Through the Arts (RTA), a New York State prison-arts nonprofit, through which he facilitated arts workshops and original theater productions in various New York State prisons from 2006 to 2008. 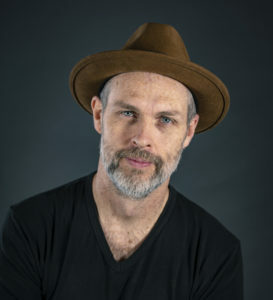 Outside of his identity as a community-based artist, Bott served as the dean for civic engagement at Wagner College from 2016-2018, and then, briefly, as director of community-engaged learning at The College of New Jersey before taking a hiatus from higher education to focus full time on Ritual4Return. He has a BA in Italian from Rutgers University and L’Università di Firenze, and earned both his master’s and doctoral degrees in Applied Theater from New York University. Kevin is happily married to Aimée Brill, an advocate and organizer for racial justice and birth equity. Together they live in Lambertville, New Jersey with their two sons, ages 10 and 8, their one-year-old daughter, and two cats of indeterminate age. The D.R.E.A.(M. 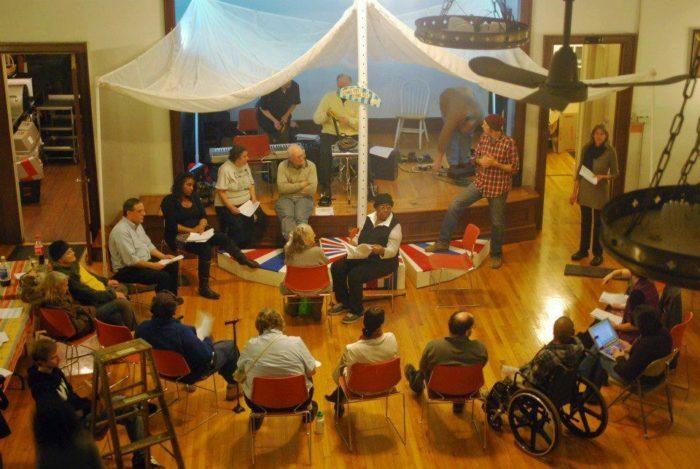 )3 Freedom Revival (2011–2015), rehearsal for revival about aging and displacement, with members of the Ida Benderson Senior Center. Image courtesy the artist. The D.R.E.A.(M. 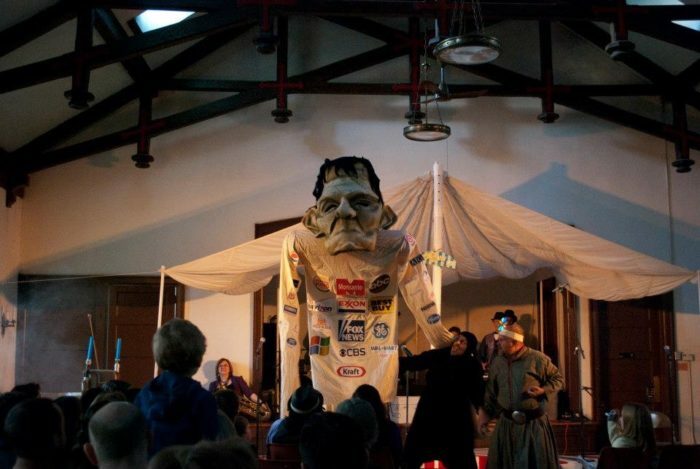 )3 Freedom Revival (2011–2015), performance on aging and displacement, with the Ida Benderson Senior Center. Image courtesy the artist. The D.R.E.A.(M. 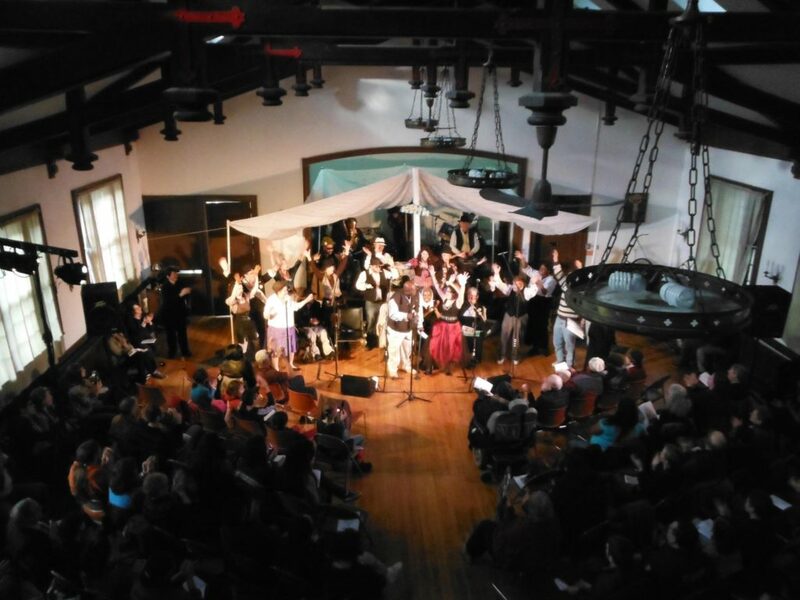 )3 Freedom Revival (2011–2015), performance/revival about corporate money in politics, with Syracuse chapter of Move to Amend. Image courtesy the artist. The D.R.E.A.(M. )3 Freedom Revival (2011–2015), performance on public education. Photo by Lee Wexler/ImagesForInnovation. J’afar Abbas and cast in Every Time You See Me… Photo by Lauren Steussy. Every Time You See Me… (2013). 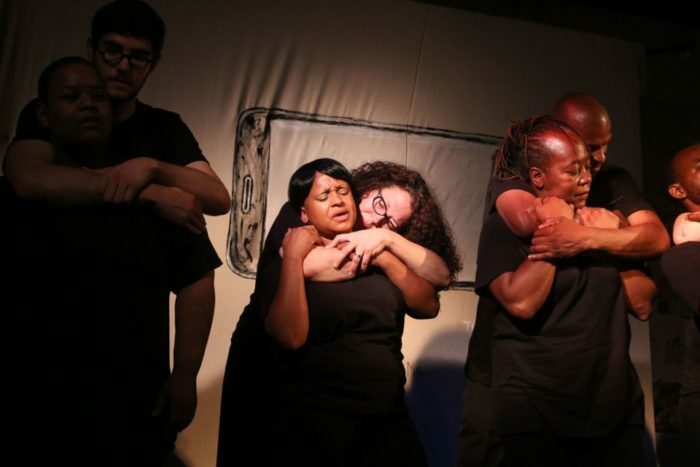 The infamous, and fatal, chokehold that killed Eric Garner is transformed into an embrace as cast members actually see one another in their full humanity. Photo by Lauren Steussy. Post-show discussion of Every Time You See Me… (2013). Photo by Lauren Steussy.